Lara Croft and the Temple of Osiris review – The Good, the Bad, and the BANG! 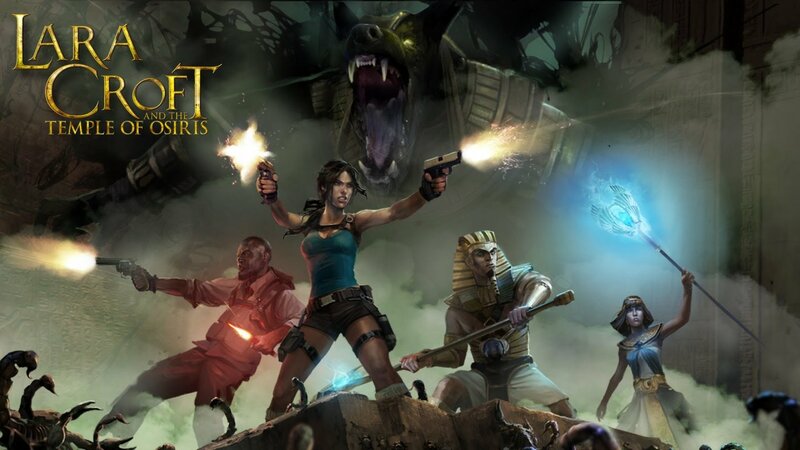 After playing through Lara Croft and the Guardian of Light twice and enjoying it very much, you can imagine my excitement for Lara Croft and the Temple of Osiris. Upon installation I sat on the couch with the very same friend that I beat the last entry of the game with, and although we still had a great time, there was just something different this time around, which I will discuss a little later on in the review. 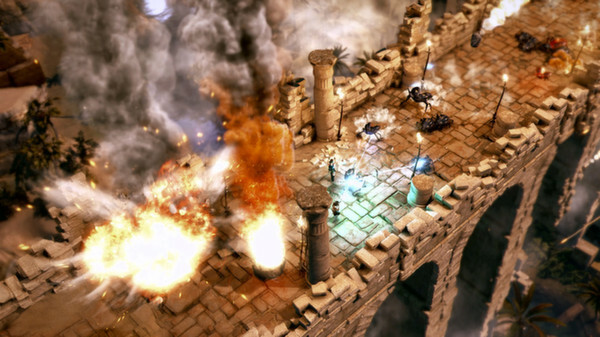 This “Lara Croft and the…” series is an off shoot of the iconic Tomb Raider franchise that features an isometric camera style and dungeon-esque exploration reinforced by team-based puzzle solving. What we are seeing a lot in video games in the last year, with varying levels of success and failure, is the resurgence of couch co-op. Guardians of Light was definitely a bright spot in the genre of couch co-op, and Temple of Osiris does its part to carry the green magical torch. Puzzles in the game grow increasingly complex as you delve deeper into the temple at a fair incline throughout the main story line. Bonus puzzles, along the way for character upgrades, get more complex at a faster rate, which is fair and frustrating at the same time. Another high point in the Temple of Osiris is the fact that the game has an auto difficulty scale and added items so that the game is still winnable in single player, although unless you are a complete and total hermit this game is and forever shall be at its peak in multiplayer. Adding replayability and the fanatical urge to search every crevice of the game are the hidden weapons, costumes, and ability modifiers. Much like the last installment the game does a great job in making the exploration and collection of equipment a simple addition to the gameplay but not necessarily a make-or-break mechanic. A person, in theory, could never ever open up the inventory menu and still beat the game; however, it is much more fun to equip power ups and rocket launchers to explode some ancient spider bugs and lion crocodiles. I wish I could turn a blind eye to the negatives in this game because I enjoyed it so much, but putting on my review cap forces me to acknowledge some pretty unfortunate letdowns in the game. For one, Crystal Dynamics has worked so very hard to revamp and evolve the Lara Croft character in the Tomb Raider series to be a more relatable and vulnerable character. It almost feels like all of that progress has been thrown out the window here in the Temple of Osiris. Personality, voice acting, and storyline all take some pretty big hits in this game. The final boss kinda just shows up after every boss fight and spouts off some generic “You haven’t seen the last of me” lines and disappears. By the end of our play time, as a test I asked anyone in the room if they knew what we were doing and all really anyone remembered was what we learned in the introductory cut scene. By no means was anyone expecting a robust storyline with decision making and dialogue options, but a few shocking twists and turns would have been nice. Another negative for me when compared to the Guardians of Light is how the controls feel more ‘loose.’ I found myself and my counterparts randomly missing easy jumps and falling off ledges more often. Possibly this was caused by slight camera tweaks or level design, but it was frustrating nonetheless. Same issue went for the grapple hook mechanics. Everything simply seemed harder to control, aim, and shoot. It’s not as frustrating as it could have been since there is no finite set of lives you have, just a couple seconds of time out when playing with friends, and then right back to the action. For the sake of this review I played this game solo, and in two-player, three-player, and four-player modes. If you are seriously contemplating the purchase and enjoyment of this game, I strongly recommend sticking to the two or three-player mark. Playing solo there is simply not enough story and depth to hold your attention with so many other games out there. Four players crowded the map a little too much for my liking and four different players all fighting for gems pulled the screen to four different directions, which got pretty tiring pretty fast. My biggest issue with the game however has nothing to do with game mechanics or story. Playing Guradians of Light we had the thought of, “This is awesome,” but I wish it had more players, with more abilities to make the puzzles even harder. It seems like the developer only heard the first part of our wish as the game was increased to four players, but each character doesn’t have their own unique set of abilities. There are basically two sets of controls and the characters are split two and two. There are essentially two ‘adventurer class’ characters: Lara Croft and Carter. They have identical load outs and abilities. Same goes for Horus and Isis, except they have more magical abilities. It would have been nice to see more character variety to ensure that everyone on the team every so often could score those ‘clutch’ moments. All in all much like the previous installment, this game is just plain ‘ol fun. We can pick at it and critique it until the scarabs come home, but with the right expectations and at an Arcade price point this game delivers.